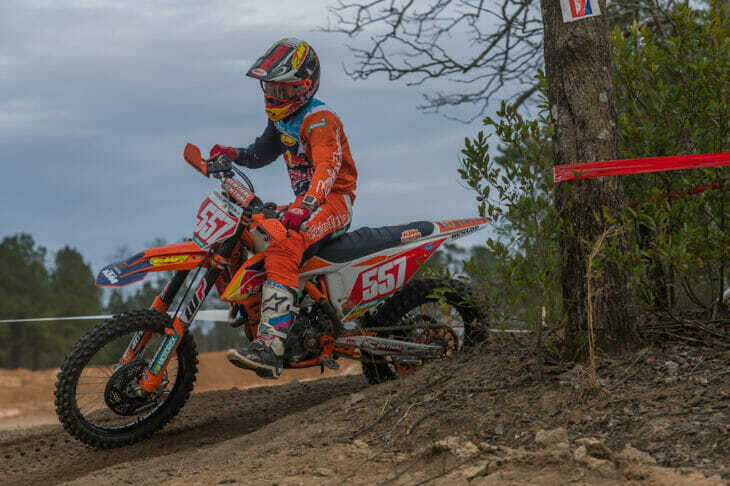 Kailub Russell won the opening round of the 2019 Kenda Full Gas Sprint Enduro Championship in Gaston, South Carolina, February 9-10. “It’s been a while since I raced this series but I’ve still got sprint speed,” said Russell. Russell (FMF KTM) was blazing hot right out of the gate, winning five out of the six tests on Saturday and topping the day’s standings. He cooled off just a bit on day two, finishing second to defending champ Josh Strang but the KTM rider had enough of a cushion to win the overall by more than 20 seconds. Strang (Babbitt’s/Monster Energy Kawasaki Team Green) ended up second overall, with Thad Duvall (Rockstar Energy Husqvarna) taking third. Duvall was plenty fast but a couple of mistakes over the two days cost him any chance of winning. Josh Toth (FMF KTM) and Evan Smith (Husqvarna/Max Motorsports/FXR Racing) rounded out the top five overall. He was also the Pro2-class winner. Tegan Temple was second in Pro2 at 11th overall. The Kenda Full Gas Sprint Enduro Series returns to action on March 2-3 in Blackshear, Georgia for round two of the series.